"'Tis better to have loved and lost, Than never to have loved at all"- Alfred Lord Tennyson. Cupid is ready with his arrows and so are we with our printable Valentine's Day worksheets. Celebrate love with utmost gusto and verve, make tokens of love such as bracelets and cards; learn new words, unscramble a few and make some too! 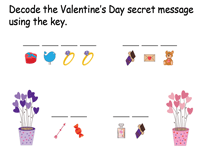 Get creative using the writing prompt, decode cryptograms, add, subtract, multiply and divide numbers, find equivalent fractions and play the Valentine's Bingo as well. 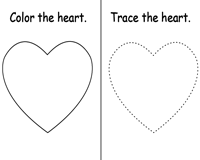 This 4-in-1 activity is definitely a great way to introduce the shape 'Heart' to kindergarten kids. 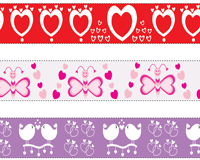 Instruct the kids to color and trace the heart, join the dots and even draw the symbol of love - heart! Spread love with this set of Valentine's Day Cards, a time-tested way of expressing love. Get little ones to snip the cards, write a love note, sign the cards with sparkling gel pens and voilà the cards are done! Simple acts of love, make great things happen! Don't believe? Try it for yourself. Print this sheet, snip the bracelets along the dotted lines, tape it around the wrist of your loved ones and watch what happens! Knock, Knock...., There's a message for you! Ahem! Ahem! Not so easy! It's encrypted. Replace the image with the corresponding letters using the key and decode the secret heartwarming message. 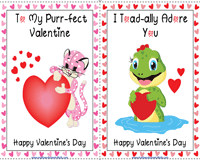 Train your brain and grow your vocabulary with this Valentine's Day picture dictionary for grades 1 and 2, comprising words and images related to the occasion. Identify the images and learn their spellings. 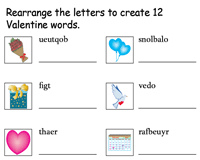 The letters of the twelve Valentine's Day words are jumbled in this worksheet. Rearrange the letters and write the correct spellings of the words. Hone the spelling and vocabulary of children with this worksheet. How many three, four and five letter words can you make from the word VALENTINE? Test the vocabulary of fourth-grade children with this worksheet. Time the activity to spice up and add more gusto. As you fill the empty hearts with love this Valentine's Day, remember to fill each set of empty hearts in these worksheets. Identify the sequence and write the missing numbers that come before, after or between. Writing prompts are a great way to stimulate the thought process of children. 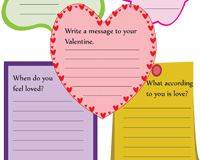 The prompts are provided in the form of questions related to Valentine's Day and help take a sneak peek into the life of students. 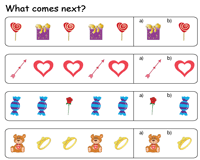 Figure out the repeating patterns and write 'What comes next? 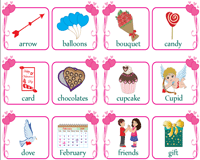 ', with this worksheet consisting of symbols of Valentine's Day like hearts, candies, candles, cards and more. Enhance your abstract reasoning skills too. Have you ever been bitten by a love bug? The bugs in this worksheet have replaced their spots with hearts, this Valentine's Day. 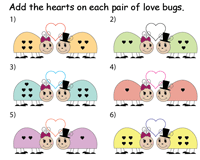 Count the hearts on each pair of bugs and write the answer on the heart. Ms. Teddy is ready to deliver the mail, but unfortunately the mailbox numbers are given as subtraction statements. 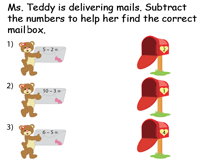 Subtract the numbers and help Ms. Teddy drop the mail in the correct mailbox. Strengthen the bonds of love, mend and heal the broken hearts this Valentine's Day! Multiply the numbers on one-half of the heart, cut the other half with the correct answer and perfectly fit the two. Struck by Cupid's arrow, this little lovebird has lost its heart. 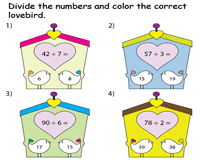 Divide the numbers on the heart and color the bird that has lost its heart in this worksheet for children of grade 4. Reduce the equivalent fractions to their lowest terms. 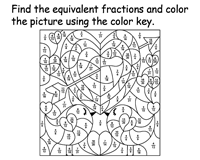 Color each fraction of the picture by following the color key to reveal the mystery picture in this third-grade Valentine's Day worksheet. Wrap up the Valentine's Day activities with this Bingo Game. 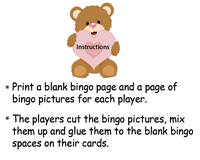 Get the Bingo boards ready, read the instructions carefully and have a fun-filled Valentine's Day.